HFS-64 is our latest offering for the professional investor and analyst. It is a state-of-the-art, 64-bit, investor information database and analysis application for professional investors and asset managers. Available on Windows, Mac, Linux, Android. TBO Advanced Charts is our latest offering for the retail investor. It is a complete technical analysis system with extensive additional information on all JSE listed companies. It also includes a vast database covering unit trusts, forex, international markets, and much more. Available on Windows, Mac, Linux, Android. TBO Reports offers a complete and extensive library of research materials, annual reports, circulars, company announcements, financial statements and much more for all African listed companies and the world's largest companies. Analyze all JSE companies by SA domiciled vs. non-SA domiciled shareholders for any period in the last 10+ years. 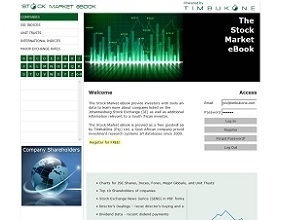 This absolutely free service provides the retail investor with a wealth of information on companies listed on the Johannesburg Stock Exchange and other useful related information. Presented in a browser and tablet friendly format for access anywhere and anytime! The Company Shareholders website lets you see all shareholders of all public companies listed on the Johannesburg Stock Exchange (JSE). The Director Analysis website lets you see detailed information on all directors of public companies listed in South Africa. Real-time JSE Stock Exchange News Service ("SENS") via Twitter. View in browser or "follow" via your Twitter account. Scanning world news for mention of JSE companies and tweeting articles found in real-time via Twitter. View in browser or "follow" via your Twitter account.